Klein Cain sophomore Rodrigo Milan’s poetry collection was chosen from 3,000 writing submissions to receive the Harris County Department of Education Board of Trustees’ Exemplary Writing Award for the regional Scholastic Art and Writing Awards. When Milan’s English II class entered their poetry unit, he had no idea that he would find a new hobby and, possibly, a pathway. Milan quickly fell in love with reading poetry and began exploring his own creative side by writing it, too. Milan’s English teacher, Lisa Walter, noticed his knack for the genre and inspired him to further explore it. The Scholastic Art and Writing Awards are a nonprofit organization that recognizes students with art and literary talent by providing scholarships and publishing opportunities. For months, Milan dedicated himself to brainstorming, drafting and revising a poetry collection he called “Internal Feelings.” He submitted it quietly and waited. Milan plans to continue enhancing his technical writing skills throughout the remainder of his high school career and beyond. 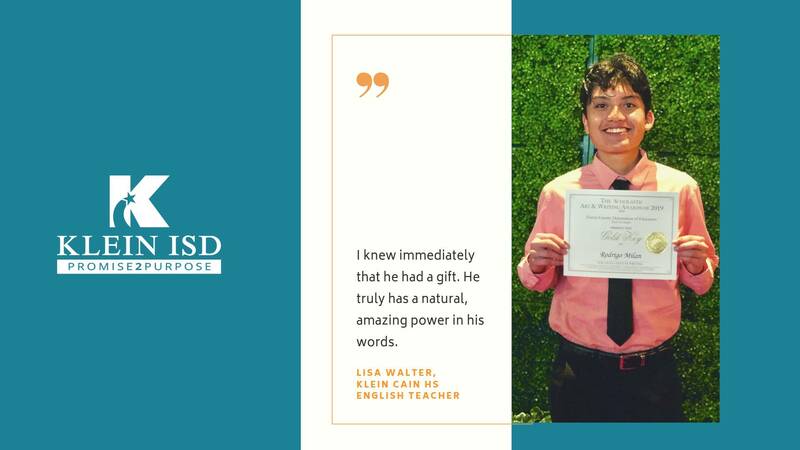 Walter believes that experiences like these give learners like Milan the opportunity to build confidence and fosters their insatiable desire to learn and grow. Congratulations to Rodrigo for embracing this challenge and a special thanks to Lisa Walter for exemplifying high-quality teaching by creating a classroom culture of risk-taking and innovation.